A crown is a tooth-shaped cover which is fitted over a tooth after it has been shaped by your dentist. A crown will help to protect a heavily filled tooth. Teeth with large fillings or with root canal fillings are often weak and can break when you bite. Teeth may also have hidden cracks which make them tender to bite on or sensitive to hot and cold. 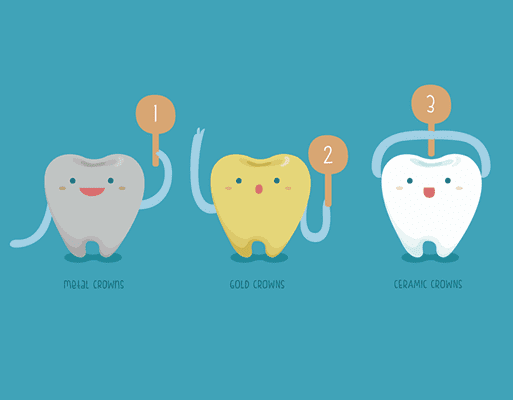 Crowns can also be used to improve the appearance of your teeth. A crown can be made from metal, ceramic or porcelain. Sometimes a crown is made from both metal and porcelain. A tooth-coloured crown is usually recommended for a natural appearance but sometimes a metal crown is advised for back teeth where the appearance is less important. This is becoming less common as improved dental materials mean there is less of a compromise between appearance and use of the tooth. How are crowns made and fitted? Your dentist will reduce the size of the existing filling and tooth to make room for the crown. If the tooth is very broken down, your dentist may need to rebuild some of the tooth by placing a post and core. Your dentist will discuss with you whether this is required. An impression (mould) is taken of the mouth which is sent to a dental technician who will make the crown. At a second appointment, your dentist will fit the crown and glue it in place.